It's beginning to look a lot like Christmas around here. Saturday I was able to finally get the main tree up. I have been so busy sewing that I haven't had time to even think of decorations. I still have more to do this week before Taylor gets home from college. I have a new white tree this year. It was a great deal on Cyber Monday. I was so happy to find one that was unlit. I weaved 500 lights onto this tree. I love sitting in the room with the lights out. 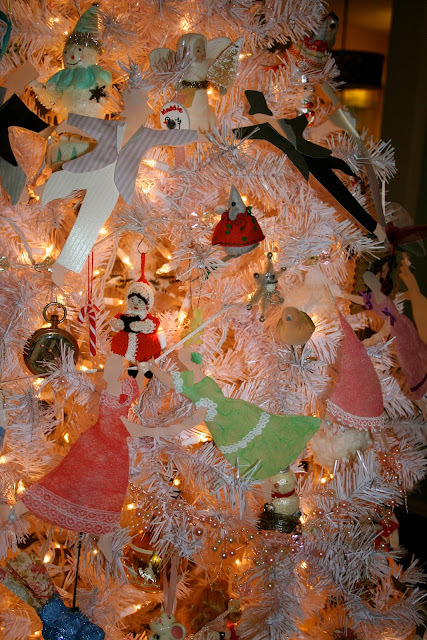 I am always thrilled to add the dancing ladies and gentlemen garland to the tree. It was made by my Mom years ago with a Martha Stewart pattern featured in her magazine. It always draws a lot of attention. The kitchen tree is up in all its dessert finery. It goes rather nicely with my Great Granny Along quilt. It makes the kitchen so festive. Renee, this tree is just luscious! I remember that garland from MS and love it. I never made it as it doesn't go with my decorations. I think it works perfectly with yours. I hope you and your family have a truly merry Christmas. That is picture perfect!! What a great garland!! I have a light blue tinsel tree that would be perfect for this, I have been looking for just the right garland!! Thanks so much for sharing. Your tree looks lovely Renee. The white is very different. They are both lovely. Well done. 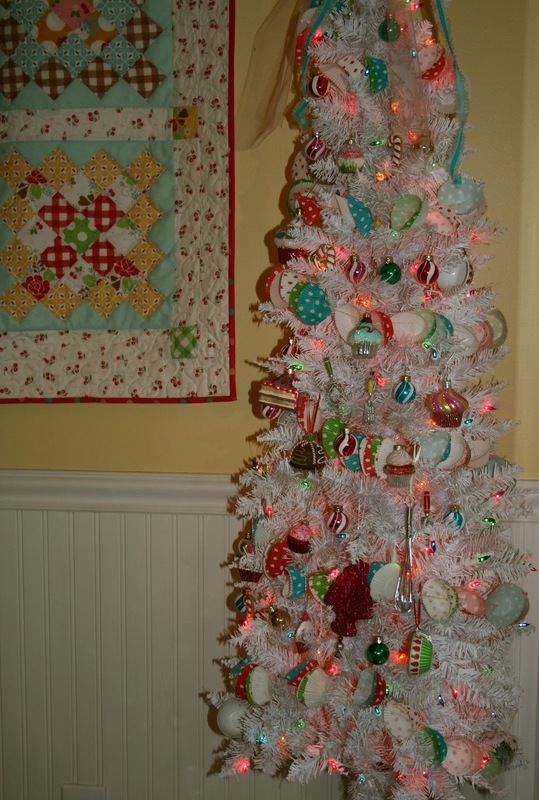 Both trees are so sweet, but I love that one in the kitchen with the quilt and the cupcake-liner garland! Your trees are both so beautiful Renee. 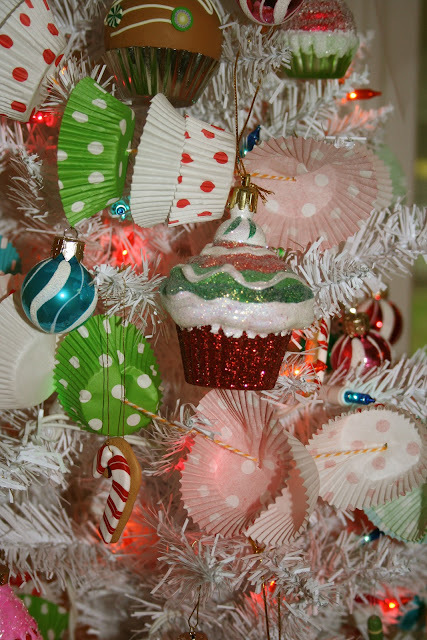 The little cupcake liner garland is such a sweet touch to your dessert tree. I love it. Love your trees! The white has invoked some happy memories for me as we had a pretty white tree during my growing up years in S.Africa. I loved it as it was always just that wee bit unique. oh my word! Look at the cupcake garland!! How PERFECT! Your white tree is lovely!